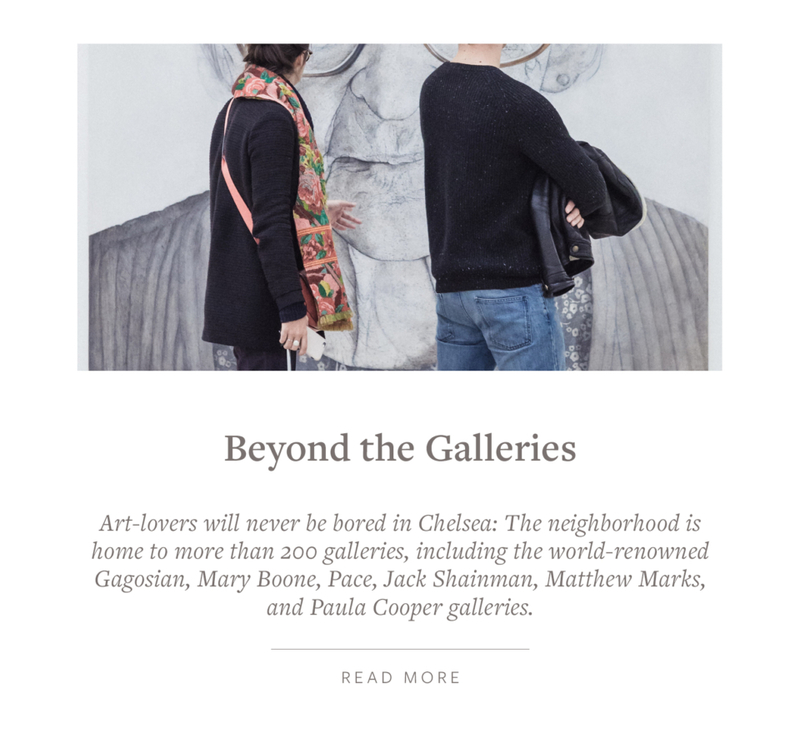 This month’s Culturally Inclined focuses on Chelsea, a neighborhood rich in history and a vibrant culture scene. The area is flanked by two large institutions: the new Whitney Museum along the High-Line and Fashion Institute of Technology (FIT) and Madison Square Garden, the Worlds’ most famous arena in the heart of the Garment District. There are over 200 renowned art galleries, a vast culinary restaurant and food scene sparked by the arrival of Chelsea Market, theater-dance and music scene, world class fitness centers and gyms: Chelsea Piers, Equinox – Highline, NYHRC, Orangetheory Fitness, Barry’s Boot Camp, Peloton, Swerve, Flywheel, Fhitting Room, Shadow Box, Soul Cycle and the list goes on, and there plenty of shopping from big box stores to high-end boutiques and luxury department stores; such as Barneys and Jeffreys, and notable historic sites to explore. 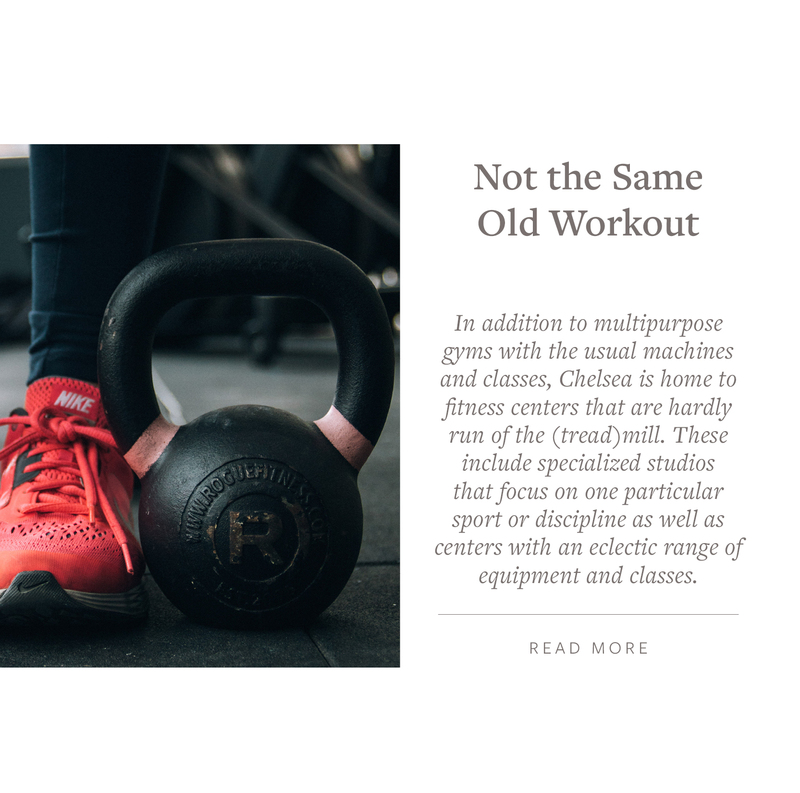 Chelsea, a blend of manufacturing, townhouses, high-rises, factories, lofts, auto garages and warehouses and spans several distinct architectural styles,— Greek Revival – Cushman Row, Italianate, Anglo-Italianate, Neo-Crec, and French, Second Empire. All of these styles are represented in the Historic District; as well as an attractive neo-Gothic church of St. Paul, and Art-Deco diner and Walker Tower condos, and modern and Starchitect high-rise apartment buildings. Chelsea’s boundaries are roughly 14th Street to the South and the Hudson River and West Street to the West, with Northern boundary variously described as 30th Street or 34th Street and the eastern boundary as Sixth Avenue or Fifth Avenue. 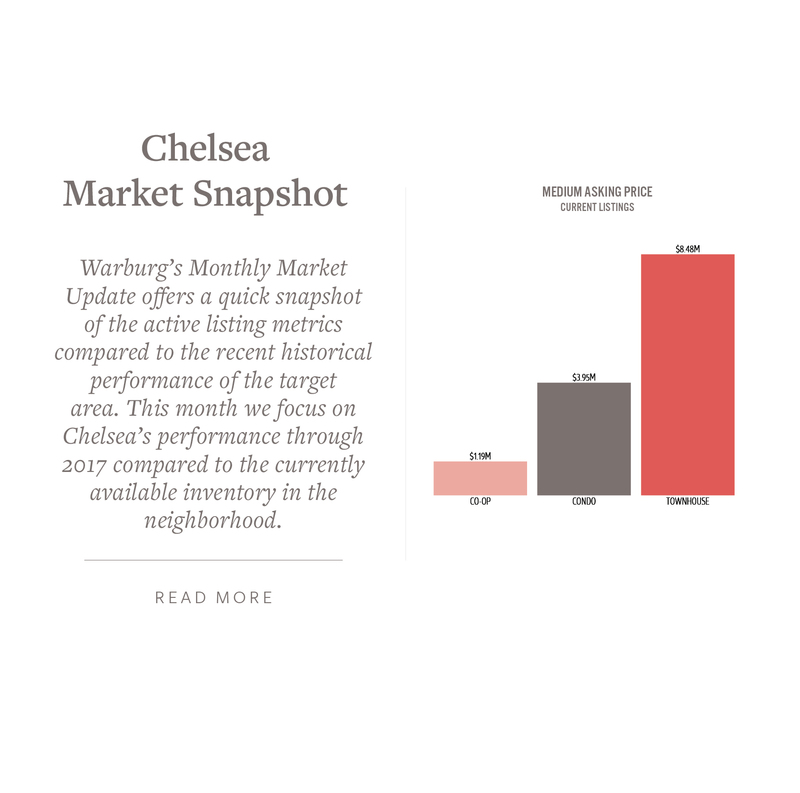 Chelsea comprises many famed commercial Districts from the past to the present day creations: Meat Packing (a.k.a. 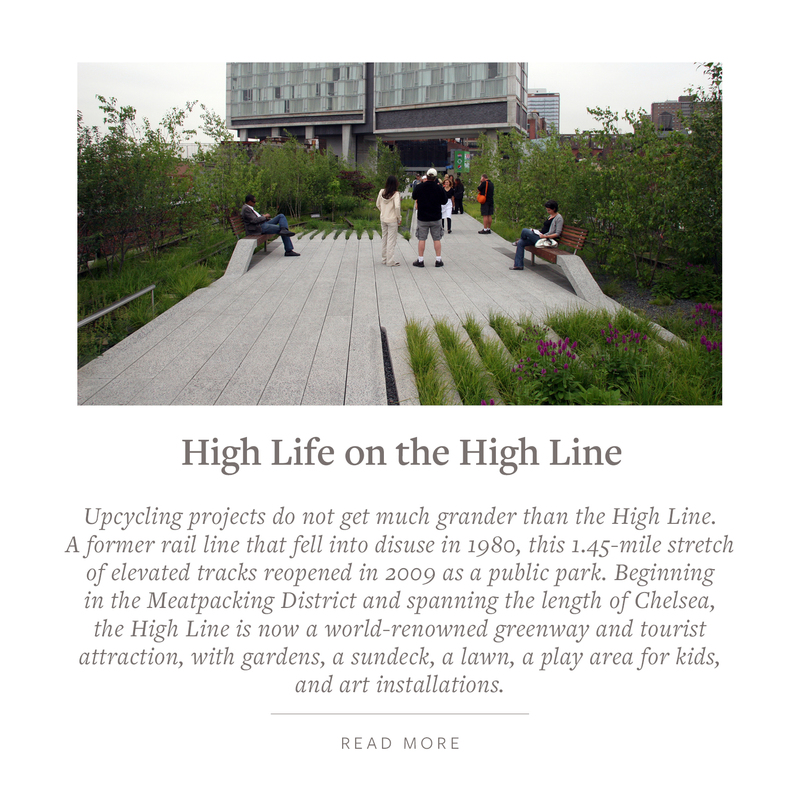 Gansevoort Market), Flower District, Gallery District | Hudson Yards | Westside Expansion (West Chelsea Historic District), Highline | Chelsea Historic| Tenderloin| Theater Row | Tin Pan Alley | Ladies Mile. Imagine before the American Revolution a mansion on a hill overlooking the majestic Hudson River surrounded by apple trees. This 94 acres estate built by British Major Thomas Clarke who named it Chelsea in honor and memory of the English veterans hospital, as well as his follow soldiers from home. During the eighteenth century Old Chelsea had a romantic route for buggy-ride courtships along the water’s edge. “Love Lane” as it was called started at Broadway (a.k.a. Bloomingdale Road) and followed a path curving along 21st Street past London Terrace lot and hugging the waterline. 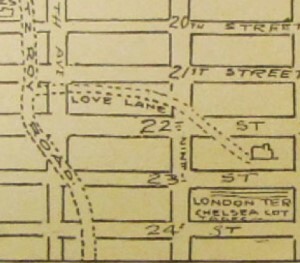 The map below or visit Randall’s Survey depicts Love Lane cutting across a defunct thoroughfare known as Fitz Roy Road. 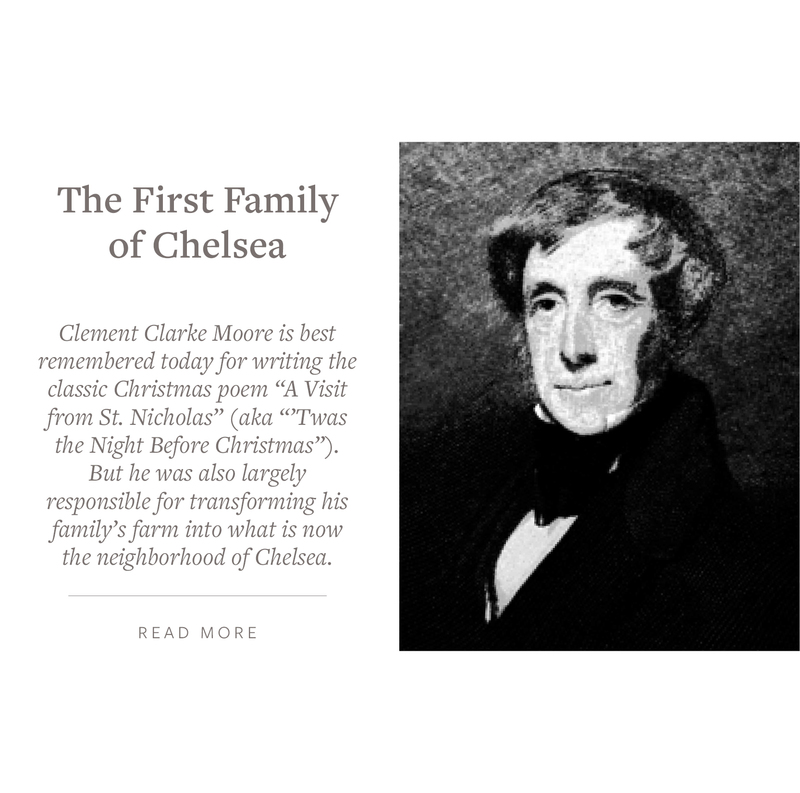 Clement Clarke Moore, a Professor of Oriental and Greek literature, Divinity and Biblical learnings, and well known for writing the Christmas poem A Visit From Saint Nick inherited the Chelsea Estate. Moore subdivided the land and donated it to the General Theological Seminary of the Protestant Episcopal Church and the Seminary and Church (now High Line Hotel) as built on the land and stands today with a beautiful interior garden. The oldest continuously operating seminary in the United States, sold a part of their land and adjoin the eastern edge of the General Theological Seminary the Chelsea Enclave, a 53 condo building with access to the seminary park was built and sold by Brodsky Group blending a modern design with the Gothic Revival Seminary buildings. Although Clement Moore had strict development restrictions as outlined in the Chelsea Historic District report the advent of the Hudson River Railroad tracks and the World’s first elevated train line up Ninth (also known as the “El rail”now (Death Avenue) the High Line) in the mid 1800’s had a profound effect on the area including the development of Chelsea Piers in 1907 for Trans-Atlantic luxury ships. In 1884, the famous Hotel Chelsea – “a place built beautifully, designed to bridge class divisions and to value the arts” – opened on 23rd Street in the area, which was then New York City’s theater district (Kellogg). This is when Chelsea’s artistic nature began, which continues to this day. There was a time where Chelsea was an area forgotten and no one knew where it was. 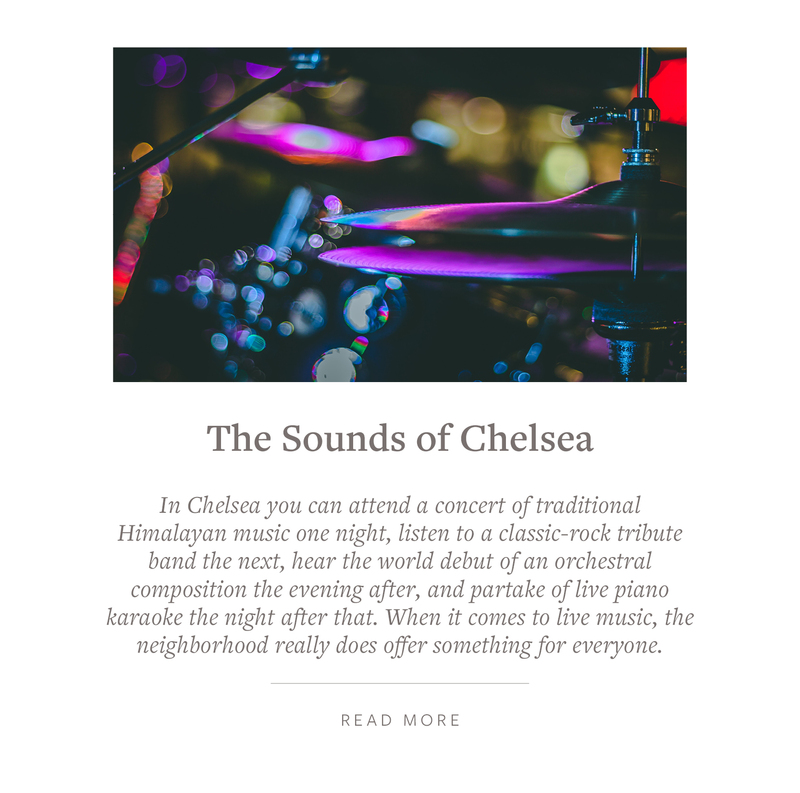 As an exuberant yuppie, introduction to Chelsea was the clubbing scene dancing under the colorful strobe lights to the syncopated beat at the Limelight and the Tunnel into the wee hours of the morning. Then my friends and I would all head to the famed 1940’s Empire Diner or Florent for a lite bite before heading home. My first apartment living on my own was a Studio in Chelsea, a one main multi-purpose room, separate bathroom and kitchen. I was so excited that the apartment had large walk in closet, charming brick wall that faced historic London Terrace with lots of natural light and just West of the famed Chelsea Hotel where many great rockers and literary giants (Dylan Thomas, O’Henry, Thomas Wolf, Arthur Miller, Mark Twain and many others) lived. In New York City we live for our closets and proximity to transportation and the arts. The area at that time remained a Meat Market literally and figuratively. Those early days the area was grittier and Chelseaites were outwardly artistic and self-expressive. And, yet the area reflected a glimmer, a fragment of the beauty of the past and the future that was on its way. The area Renaissance began with the New York City Waterfront Greenway Project creating open spaces for pedestrians, cyclists and commuters in concert with the launch of Chelsea Piers Sports Fitness Center and beautification of the Hudson River Parks, followed by the opening of Chelsea Market in the Old Nabisco Biscuit building known for the creation of the first Oreo cookie (click on link for vintage commercials), Lorna Doone, Nutter Butter, Mallomars and Saltines. Now Chelsea market is home to a vast array of food specialty shops, restaurants and media and broadcasting companies (Food Network, Oxygen Network, MLB, BAMTech, EMI Mush Publishing, local cable stations) and across the street is the Google headquarters, which just increased their footprint with a $2.4 Billion Deal for Chelsea Market. With the decline in manufacturing, the high-end galleries took residence in these buildings and permeated the far western corner or Chelsea. And, the arrival big-box stores (Pottery Barn,Old Navy, Bed Bath & Beyond, Container Store, Modell’s Sporting Goods, Men’s Warehouse, T.J. Max, Lowes, and Home Depot and Trader Joe’s) along the old Ladies Mile corridor of 6th Avenue, the Rubin Museum — an arts and cultural hub showcasing the Himalayas, India and neighboring region, and the High Line, a 1.45-mile-long elevated linear park, Greenway, the famed architect Ralph Thomas Walker art deco telephone building: Walker Tower 50 unit condo conversion where A-Listers flocked to at record prices, Avenue’s World School an international system of for profit private school for pre-K-12th grade in 2012, and rail trail and Hudson Yards, a 28-acre mega development continues to transform and inspire more development in the area. 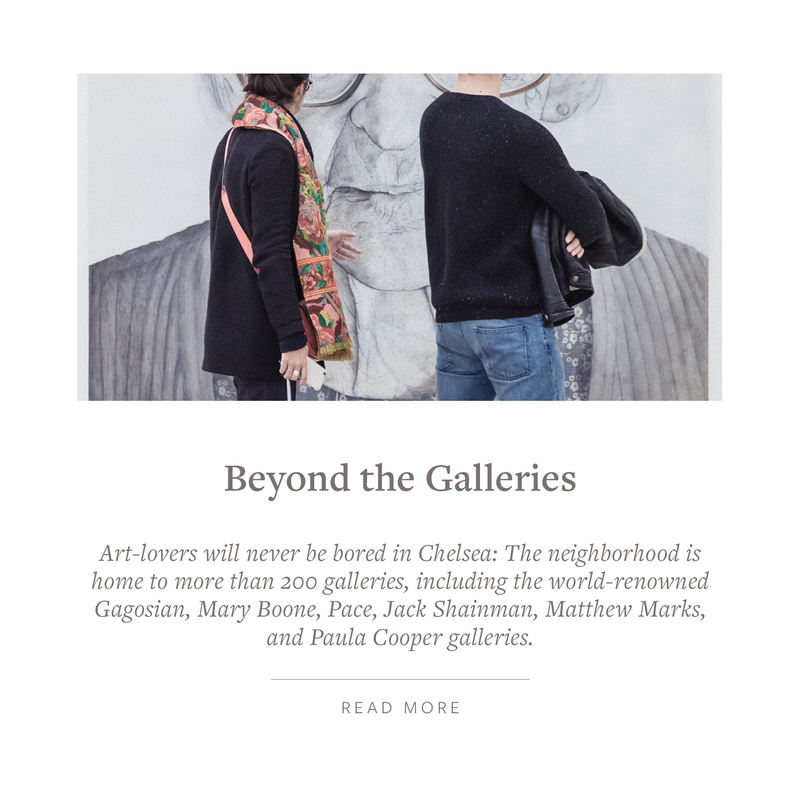 Eclectic Chelsea is leading the path to New York’s future with a growing office district, food, arts and cultural destination. Chelsea has the only public gun range in Manhattan: the Chelsea Westside Rifle and Pistol Range – 20 West 20th established in 1964 and is home to the Joyce Theater, an International Leader for dance presentation and The Kitchen one of New York City’s oldest nonprofit spaces, showing innovative work by emerging and established artists across disciplines. And, repertory theater companies: Urban Stages – 259 West 30th Street | Atlantic Theater Linda Gross – 336 West 20th Street located in a Gothic Revival Parish House for St. Peter’s Church built in 1871 | Atlantic Theater Company Stage 2 – 330 West 16th Street – new play house inauguration was June 2006 | Irish Repertory Theater – 132 W 22nd St recently renovated. Given it’s Valentine’s Day and George Washington our Founding Father’s Birthday month, Chelsea has many amazing establishments to pick-up a sweet to celebrate. Sweet Tooth lovers check-out Empire Cake – 112 Eight Avenue | City Cakes – 251 Eighth Avenue (Lower Level) | Billy’s Bakery – 184 Ninth Avenue, Harbs a Japanese Cakes & Coffee restaurant serving lite fare on 198 Ninth Avenue, and La Bergamote Patisserie at 177 Ninth Avenue. Additionally, the area has the best donuts: Donut Pub established 1964 – 203 West 14th Street…..Dough on 14 West 19th Street | and Donut Planet – 220 West 23rd Street. Or, plan a romantic rendezvous or an evening to quench your thirst at one of these cool Speak Easy | Cocktail Bar establishments: Bathtub Gin – 132 Ninth Avenue. The Stone Street Coffee shop is it’s cover, but head on in through the secret door and you will find a space designed in the spirit of the prohibition era with its own cooper tub | Raines Law Room – 48 West 17th Street (between 5th & 6th) the intersection of Chelsea and Flatiron you will find a Black door drawing you to a subterranean clubby space. 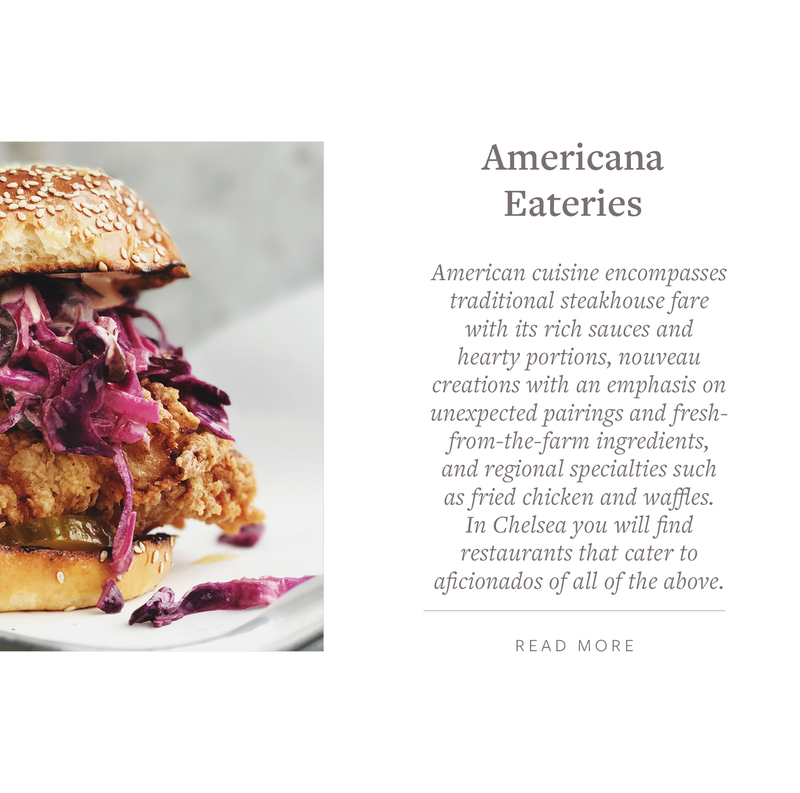 Call in advance for reservations since its very popular | The Tippler – 425 West 15th Street located in the Basement of Chelsea Market. The space was designed with “water tower wood and train rails from the nearby High Line harkening to the areas industrial past | Porchlight – 271 11th Avenue a cocktail bar with a Southern twist | Electric Room and the PHD Rooftop Lounge– in Dream Hotel. I look forward to continuing exploring the vibrant neighborhoods of New York with you. Reach out to me to say hello and tell me about your neighborhoods adventures. I am available to answer any questions and guide you or someone from your network through the changing real estate market.